Welcome to our fifth annual FORTNIGHT OF FRIGHT event! Thanks for checking out the SIXTH (is it really!?) 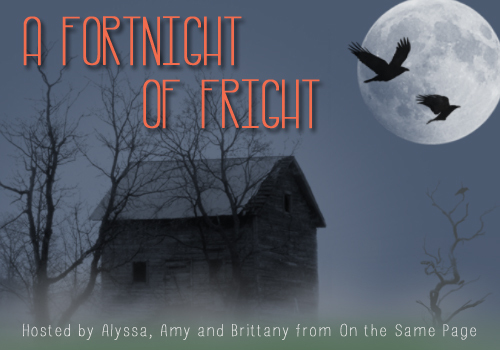 annual edition of FORTNIGHT OF FRIGHT where Alyssa (Books Take You Places), Amy (Tripping Over Books), and I bring you two full weeks of Halloween-related posts! We’ve invited bloggers, authors, and book lovers alike to share their favorite things about Halloween and we feature a new person and post each day. Today, Angela from Angela’s Library is sharing her Halloween reading recommendations! Check out her recs below! Hi, everyone! I’m so pleased to be participating in Fortnight of Fright for the third year running. I’m generally a big wuss when it comes to scary movies, but I love me some creepy books. Below is a list of my top five recommendations for Halloween reads. The Coldest Girl in Coldtown by Holly Black: My love for this novel knows no bounds, to the point where it’s hard for me to write coherently about it. Instead, I tend to simply gush and ramble about how it’s dark and sensuous and horrifying and thrilling all at once. The book starts with 17-year-old Tana waking up after a party to find she’s one of the sole survivors of a vampire massacre. Traumatized, Tana escapes with her newly infected ex-boyfriend and an ancient, possibly mad vampire whom she’s rescued from his bloodthirsty peers. Knowing the three of them aren’t safe to be around normal society, Tana checks them all into Coldtown, a vampire quarantine where people often go in…but rarely come out. Their adventures and dangers ensue from there. Thanks so much, Angela! I’ve only read a couple of these but have a few more on my TBR! Thanks so much for your post today! This entry was posted in A Fortnight of Fright, Blog Event, Books and tagged A Fortnight of Fright, Book Recommendations, Books, Halloween, Horror, Paranormal, Recommendations on October 17, 2017 by Brittany. I haven’t read any of those books, but damn those covers are creepy – and gorgeous! Aren’t those covers the best?! I confess that’s what drew me to all of them in the first place, haha. Wow! I love creepy books but you somehow managed to include five that I haven’t read! I have been hearing some good things about The Coldest Girl in Coldtown and This Is Not A Test so I really might pick those up. Also, great graphic!! And yes, definitely try This Is Not A Test and The Coldest Girl in Coldtown! Not sure if you’re an audiobook fan, but if you are the audio version of The Coldest Girl… is out of this world. I just finished listening to it last week and loved it even more than the print version of the book. Project Cain sounds really terrifying in particular! I haven’t read any of these books but the covers are creepy and they sound like perfect Halloween choices. Great post Angela! Thanks, Morgan! Project CAIN definitely gave me goosebumps. It’s so different from any other book I’ve read and is a great mix of fascinating and shiver-inducing.